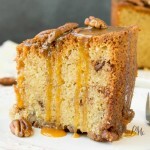 I love this Praline Glazed Pumpkin Pound Cake. It’s soft, springy, moist and fluffy. 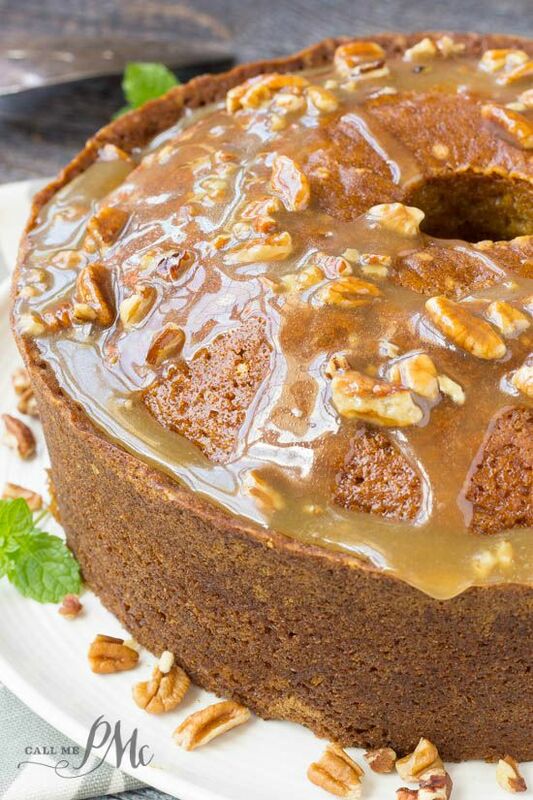 Smothered in a pecan praline sauce makes it even more rich and decadent. 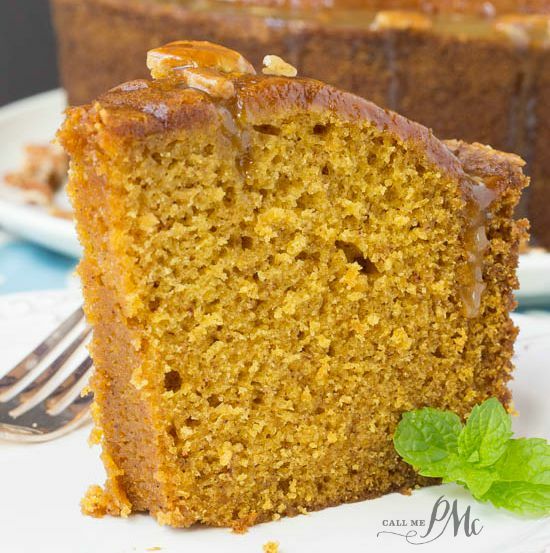 I find pound cakes to be comforting and this Praline Glazed Pumpkin Pound Cake is no exception with the warm flavors of pumpkin pie spice. It’s soft, moist, finely textured with an even crumb. 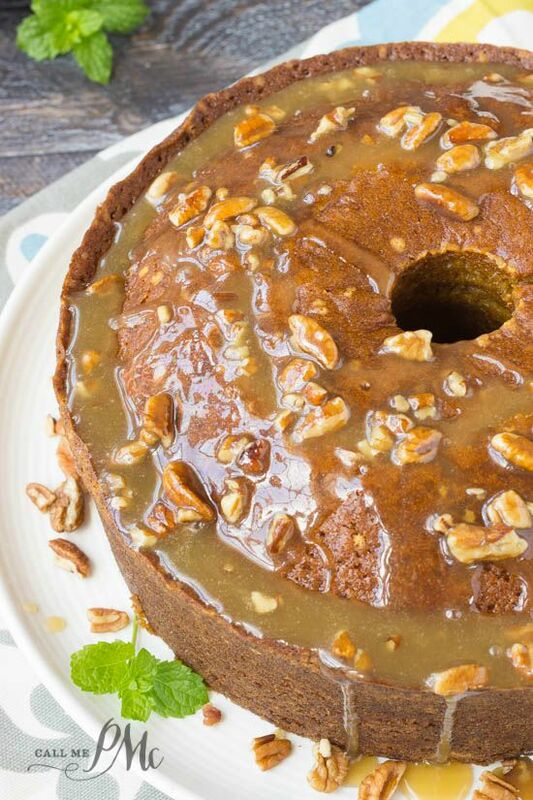 I smothered this Praline Glazed Pumpkin Pound Cake with a praline sauce which is basically caramel and pecans. 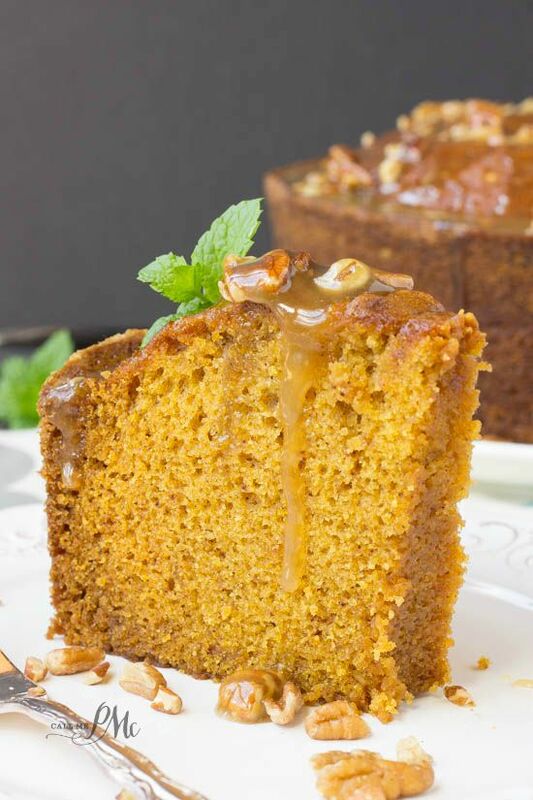 Drizzle it over on the cake while the cake is still warm and it’ll ooze into the cake. Southerners love a ‘wet’ cake! 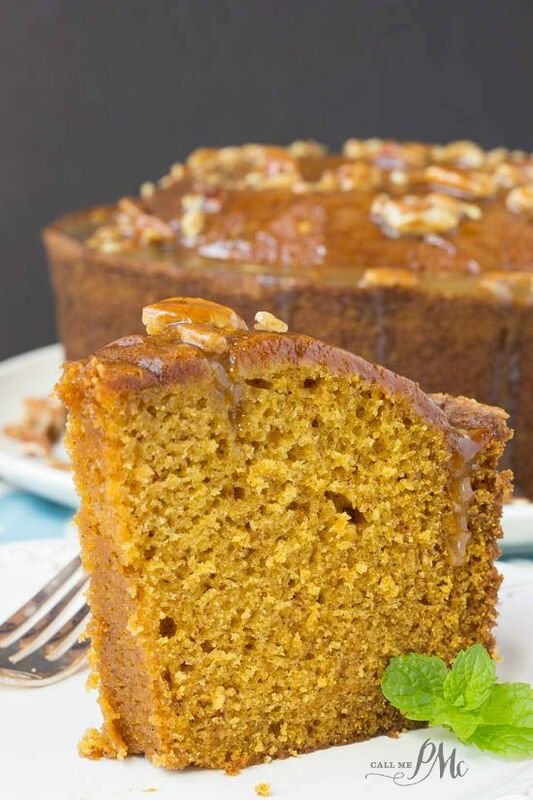 Pumpkin puree and oil keep the cake moist. If you want a good pound cake, you have to use good ingredients: real butter, good flour. I don’t recommend store brands when baking. It’s really important also when baking to measure correctly, especially the flour. I wrote about how to measure in this post. Too much flour will result in a heavy, dry pound cake. Not enough will result in a dense, flat cake. Always, always let your butter and eggs come to room temperature when baking. Take time to cream the butter and sugar until it’s light and fluffy. However, don’t overmix your ingredients when you begin adding the flour. Overmixing flour develops the glutens and will make the cake tough. Watch your cake closely and do not over bake it. I suggest calibrating your oven so the temperature is correct. Cool your cake in the pan 20 to 30 minutes, but not much longer than that. The fats in the cake need to be warm to release from the pan. 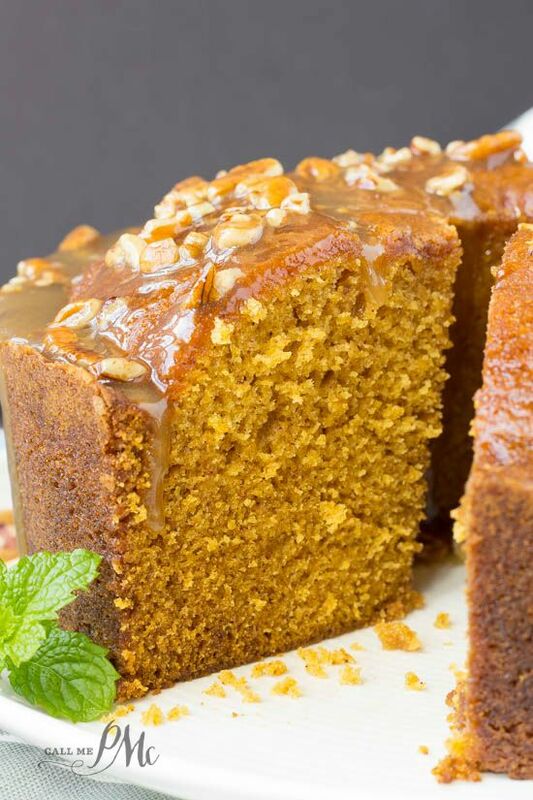 I love this Praline Glazed Pumpkin Pound Cake. It's soft, springy, moist and fluffy. 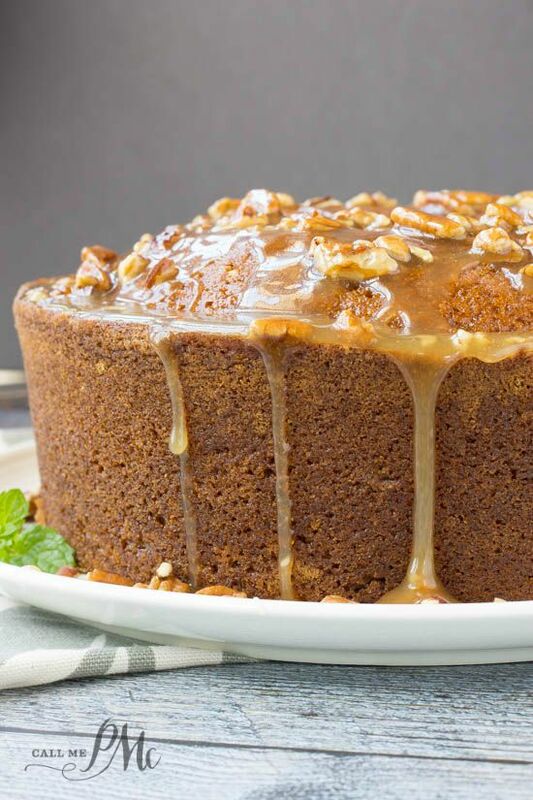 Smothered in a pecan praline sauce makes it even more rich and decadent. Spray a tube pan with non-stick spray. Stir together flour, baking soda, salt, and pumpkin pie spice. To the bowl of a mixer, cream sugar and oil. Add eggs one at a time, beat wel after each addition. 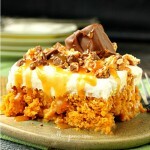 Add pumpkin and vanilla and mix. Slowly add flour and beat on low until it is incorporated. Place tube pan on cookie sheet and bake 75 minutes or until done. Cake is done when wooden inserted into the center of cake comes out clean or with dry crumbs. Allow cake to cool 30 minutes on wire rack before inverting to serving tray. Toast pecans in a pan on medium until fragrant. Remove from heat. Heat butter, brown sugar, granulated sugar, vanilla, and milk in a sauce pan on medium heat. Stir constantly. When mixture reaches a boil, boil 1 minute exactly. Stir constantly. Remove from heat and stir in confectioners sugar to thicken. Stir in pecans. Pour over slightly cooled cake. 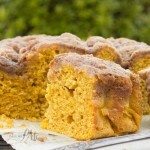 See all the recipes in my Pound Cake Review Series! I’m making this cake right now and noticed that the directions don’t include adding the vanilla. Just thought you’d like to know ! Can’t wait to try this cake! 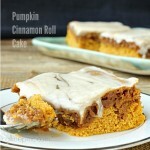 The Praline Glaze Pumpkin Pound Cake turned out well but I would have liked more of the pumpkin spices. I was not a fan of the glaze. Could I use a bundt pan? I don’t have a tube. The recipes all look delicious and wanting to be tried. Thank you for all the recipes and your blogging. Please continue all your hard work. This pound cake looks really delicious! Love the color and I am sure it has lovely taste. This looks crazy delicious. I’ve never tried making pound cake, but I can’t wait to try this version. 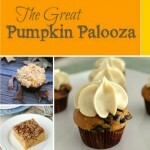 Pinned to my Pumpkin board!